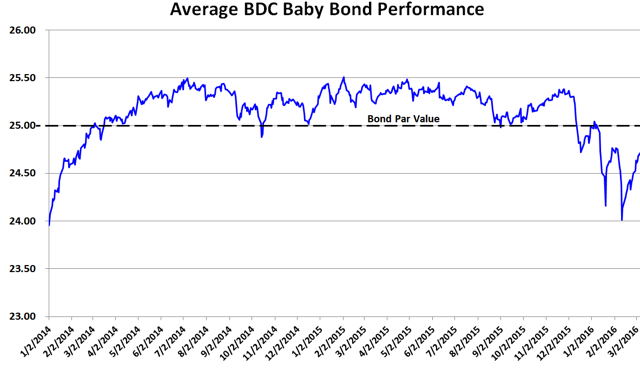 Baby Bonds For BDCs: Set To Rise? I am expanding my coverage of business development companies to include "Baby Bonds". 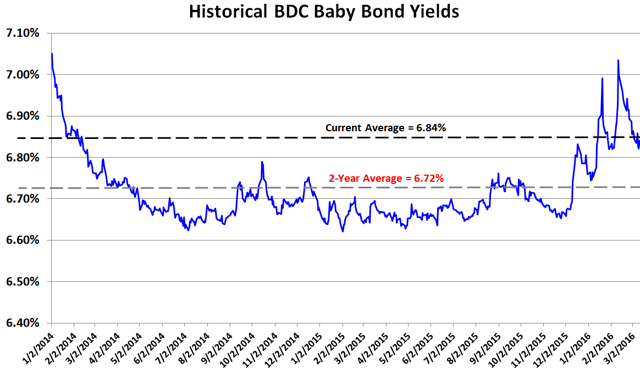 The average yield for BDC bonds is almost 7% with less risk and pricing volatility than common stock. There is a good chance that bonds could be an appropriate investment for 2016. 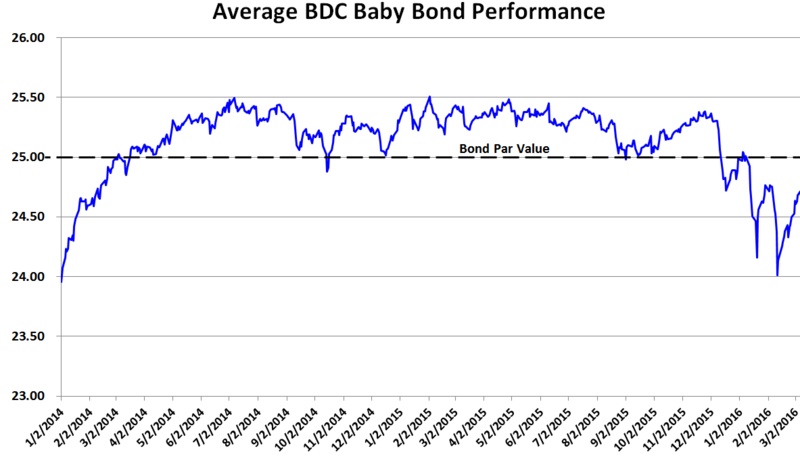 I am expanding my coverage of business development companies ("BDCs") to include Baby Bonds (also known as exchange-traded debt) for investors that would like to limit the amount of pricing volatility and overall risk in exchange for lower yields. There is a good chance that bonds could be an appropriate investment for 2016 for a few reasons (beyond typical portfolio diversification) including upcoming lower bond yield expectations and delayed rate increases by the U.S. central bank as predicted today "Morgan Stanley Says Bonds Set to Surge in 2016 Year of the Bull". "Baby Bonds" are debt issues with a par value under $1,000 ($25 for most companies including BDCs) and senior in liquidation preference to the common and preferred stock. Baby bonds are traded on the New York Stock Exchange or the Over the Counter market with greater liquidity than a standard bond. Most baby bonds pay interest quarterly and many of the longer term bonds are rated by a major rating agencies including Standard and Poor's, Fitch and Moody. I will be discussing this information in the upcoming articles for this series as well as important considerations including asset and interest coverage comparisons for risk assessment. 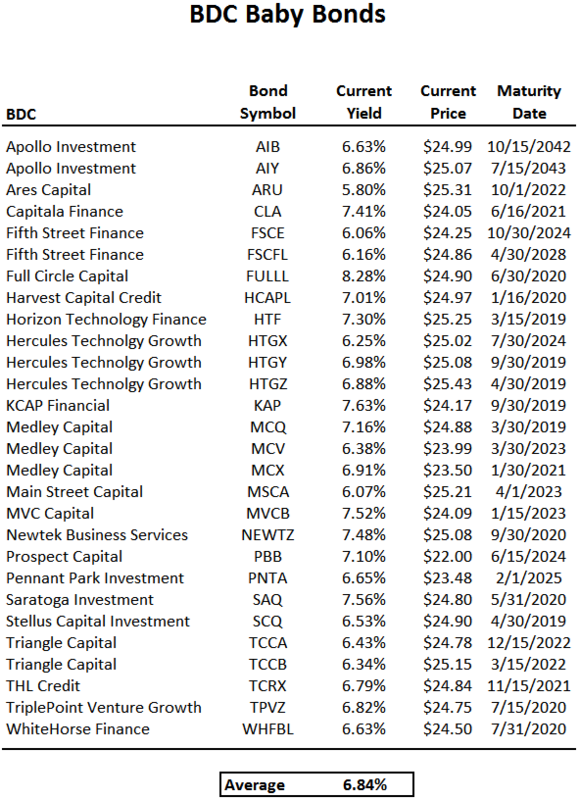 The following table shows baby bonds for Apollo Investment (OTC:AINV), Ares Capital (NASDAQ:ARCC), Fifth Street Finance (FSC), Full Circle Capital (FULL), Harvest Capital Credit (NASDAQ:HCAP), Hercules Technology Growth Capital (NYSE:HTGC), Horizon Technology Finance (NASDAQ:HRZN), KCAP Financial (KCAP), Main Street Capital (NYSE:MAIN), Medley Capital (NYSE:MCC), MVC Capital (NYSE:MVC), Newtek Business Services (NASDAQ:NEWT), PennantPark Investment (NASDAQ:PNNT), Prospect Capital (NASDAQ:PSEC), Saratoga Investment (NYSE:SAR), Stellus Capital Investment (NYSE:SCM), THL Credit (NASDAQ:TCRD), Triangle Capital (NYSE:TCAP-OLD), TriplePoint Venture Growth (NYSE:TPVG) and WhiteHorse Finance (NASDAQ:WHF). Over the last two years, baby bond yields for BDCs has ranged between 6.6% and 7.0% with an average of around 6.72%, but currently higher at 6.84%. BDC investors that are looking for less pricing volatility (relative to common stock), should consider bonds. As shown in the chart below, the average bond has traded close to par over the last two years. Typically, bonds with shorter durations will experience less price movement than those with longer durations until maturity. As mentioned earlier, I will discuss some of the typical measures for baby bonds along with my view of risk assessment when choosing these investments in the following articles in this series. For a list of all my articles including interest rate discussion, BDC rankings (risk, return, pricing, dividend potential), target pricing charts and valuations, individual dividend coverage potential, my historical purchases and current positions, and suggested BDC portfolios, please see my "BDC Research Page" and for my free monthly newsletter, please visit "BDC Buzz.com".